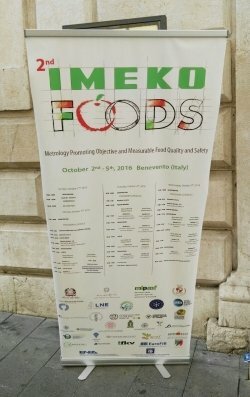 Dr. Simone Bellassai presented the speech “Innovative At-Line Quality and Process Control Methods in Food&Beverage Industry” at the 2nd IMEKO FOODS “Metrology Promoting Objective and Measurable Food Quality and Safety” in Benevento. In the last few years the quality and process control methods have acquired increasingly importance to ensure health and safety in the food and beverage products. CDR has been working in the food and beverage diagnostic for about 15 years. Over this time, it has developed a wide range of systems, CDR FoodLab® range, able to perform analysis on the most different matrices such as milk, oils and fats, eggs, wine, beer, cider and so on. These systems, are developed and customized to be as much easy as possible, indeed they are used in QC laboratories but, most of all, they are used directly at-line by no analytical skilled people in the food and beverage industry. In fact, with the collaboration of some important food industries, universities and research institutes, CDR made several studies to optimize the analysis systems of the CDR FoodLab® range to better satisfy the needs of the food & beverage industries making easier and more fast the at-line quality and process control. Innovative at-line quality control methods in Food & Beverage industry from CDR S.r.l. Innovative at-line quality and process control methods in food&beverage industry – The CDR FoodLab® range analysis systems was last modified: October 12th, 2016 by CDR s.r.l.